Puglia where tradition, culture and environment meet: this is "Masseria Tenuta Odegitria", an ancient farmhouse in Puglia, immersed in the Valle d'Itria of Martina Franca. The farm has six apartments and trulli house, as well as swimming pool reserved for guests and tennis court and provides a bed and breakfast or holiday home. It is a starting point for the sandy shores of the Adriatic and Ionian and for excursions on foot or by bike or car to the most beautiful tourist destinations of Salento and Puglia as Martina Franca, Locorotondo, Alberobello, Cisternino and Ostuni. Tenuta Odegitria offers also a tennis court in synthetic grass of regulatory size. Guests of the estate can use it without any overcharge. With comfortable sun recliner and a wide gazebo, the pool is surrounded by a broad green area that can be also used as a solarium or to spend relaxing moments having a walk or reading a book at the shadow of an olive or a fig tree. A stone wall surrounds the pools area making it even more private and welcoming. Salt is used to purify the water of the pool so that it tastes like sea water, but with a much inferior salt concentration. A peaceful haven minutes to so many sites! 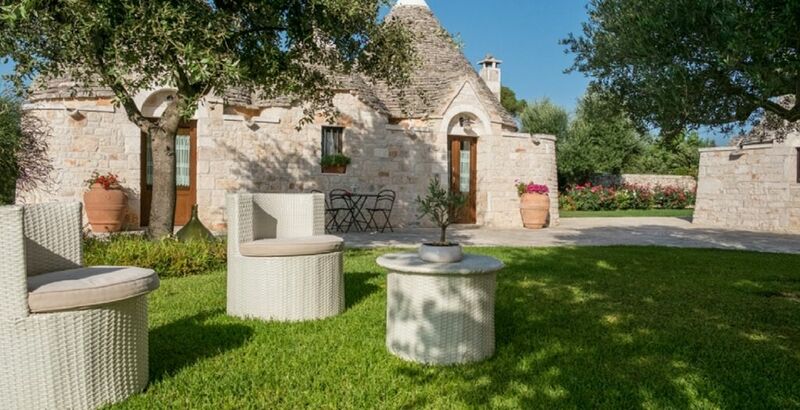 The spacious Trulli was just perfect We were able to cook and lounge by the pool. Enjoy the gardens and sit outside for coffee or wine. Loved it!! Beautiful property, well looked after. Il Trulli Aia was very well appointed, the grounds were gorgeous,, breakfast was good. Tenuta Odegritia well situated close to Martina Franca, Locorotondo and Alberobello. There were plenty of places close by to dine. Driving was an adventure, the walled roads were tight in places. The pool was great, an oasis. The only draw back was the beds were soft and the shower was tight...perhaps we are too big. We thoroughly enjoyed our stay, our hosts were attentive and we highly recommend Tenuta Odegitria.